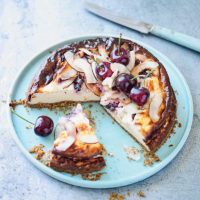 Make summer extra-special with this baked cheesecake, with its marbling of fresh cherries and hint of coconut. For even more indulgence, use a third pack of soft cheese in place of the Quark. 2. Place the biscuits in a food processor to make into fine crumbs. Mix well with the desiccated coconut and butter, and press into a 20cm round loose-bottomed cake tin. 3. Whisk the soft cheese, Quark, eggs, sugar, vanilla and coconut cream in a large bowl, and pour over the crumb base. Roughly chop half the cherries and scatter over the top with the coconut slices. Bake for 1-1¼ hours until golden on top but still with a slight wobble. Remove from the oven and cool completely in the tin. Remove from the tin and place on a platter. Serve topped with whole cherries and shavings of toasted coconut, if you wish.